The endangered Maned Wolf, the world’s largest and most beautiful canid. 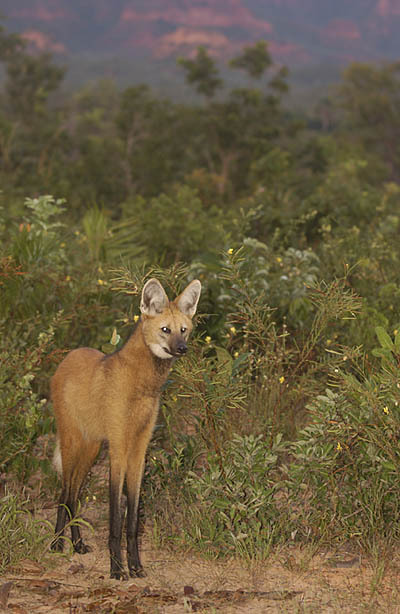 Maned Wolves scouting for mice, Parnaíba Headwaters National Park, Brazil. We really enjoyed the set-up. Lourival and his family are a special treat and the relationship between man and beast is just remarkable. Our guide Rafael – absolutely super (intelligent, enthusiastic, knowledgeable, aware of your interest and always tries to accommodate you) – 10/10. Maned Wolves – a real nature experience and excellent photo opportunity – 10/10. Hyacinth Macaws – from a view point were excellent. However, the hide doesn’t allow for panning during the early morning light. Capuchin Monkeys – the two families we visited performed like movie stars – 10/10. 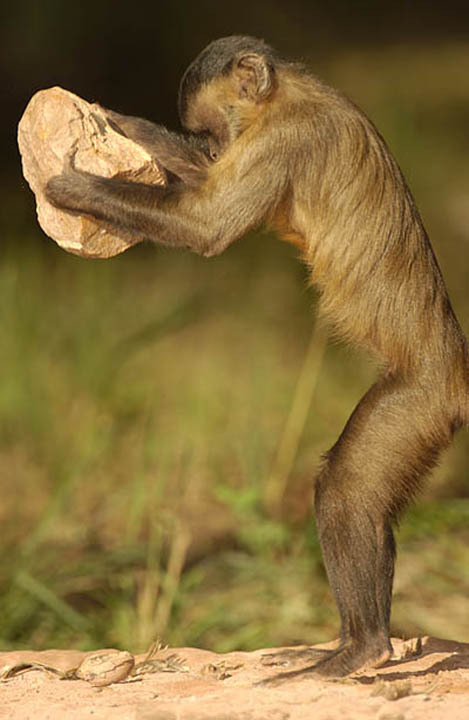 The world’s first documented case of tool use in wild monkeys. Tours depart daily from Barreiras, Brazil, which can be reached on weekday flights from the cities of Brasilia, São Paulo or Salvador da Bahia. 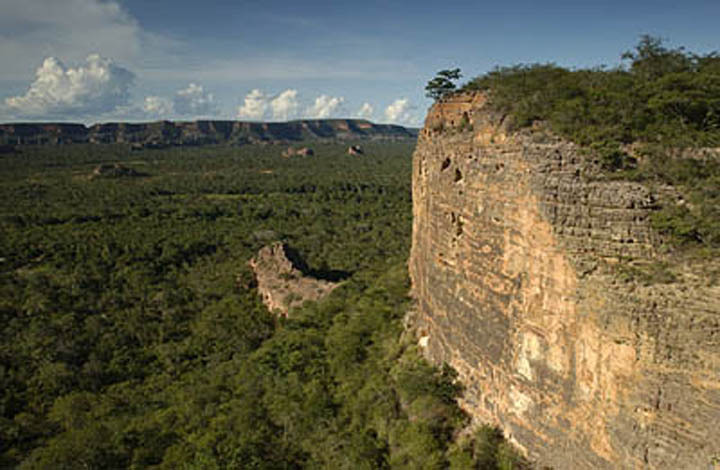 We meet you in Barreiras to begin the five-hour drive through the wooded savannah, dry scrubland and the red mesas of Wolf Cliffs. Approximately 95% of the drive is on asphalt, and that takes about four and one half hours. The last hour of that drive, between the town of Corrente and the hamlet of São Gonçalo do Gurgueía, features dramatic, 1,000-foot-tall, red cliffs. Then from São Gonçalo to the first Wolf Camp, we drive one-half hour on a rock, dirt and sand road through the bush. Season: The Maned Wolves, Bearded Capuchin Monkeys and Hyacinth Macaws all are best seen in May, June, July and August. 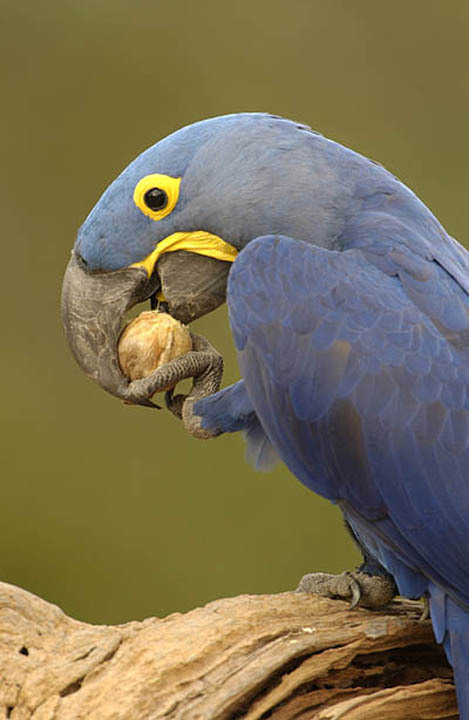 Hyacinth Macaw viewing is guaranteed only from 15 April to 15 July. See details at More about Wolf Camps. The land price includes escorted transfers, private excursions with a naturalist guide, entrance fees, private bungalow with private bath, full board, as well as all land transportation. All prices are per person based on two people sharing a bungalow. Travel insurance is not included, and there are no refunds. Therefore, we strongly recommend that you purchase travel insurance by Travel Guard to protect yourself and your investment in the tour. Location: Parnaíba Headwaters National Park, Northeastern Brazil. Reserve size: 19,000 acres within and adjacent to the 1.8-million-acre Parnaíba Headwaters National Park. Wildlife it protects: Hyacinth Macaws, Green-winged Macaws, Blue-and-Gold Macaws, Burrowing Owls, Great Potoos, Maned Wolves, Jaguars, tool-using Bearded Capuchin Monkeys and Black-and-Gold Howler Monkeys. 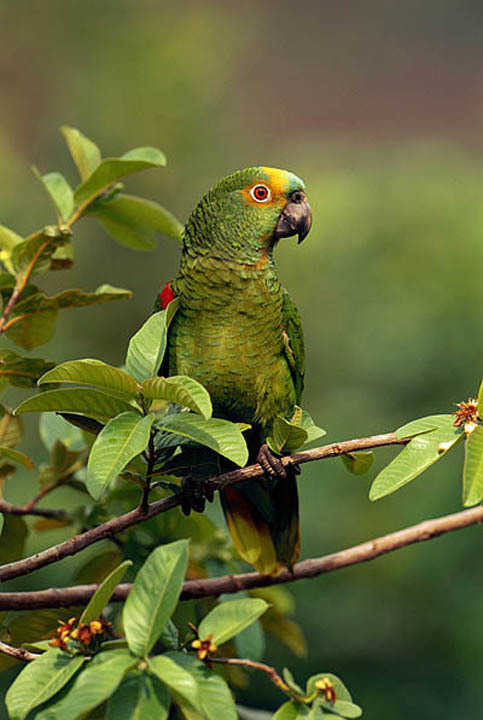 The largest and most spectacular of the world’s 345 parrot species. Hyacinth Macaw, Parnaíba Headwaters National Park, Brazil. Every half century or so, an amazing new wildlife destination bursts onto the South American scene. Such is the case for Wolf Camps of the sunny, dry forests of central Brazil. No other destination in Brazil offers so much charismatic wildlife in so little time – and with so much comfort. This new camp complex is located at Brazil’s new, 1.8-million-acre Parnaíba Headwaters National Park. At one-third the size of New Jersey, this park is Brazil’s largest outside the Amazon and protects far more dry tropical forest than any other reserve on Earth. Only 10% of the world’s original dry tropical forest remains today, while half of all wet tropical forest still stands, so the Parnaíba Headwaters National Park is of exceptional conservation importance. Bearded Capuchin Monkey with palm nuts, Parnaíba Headwaters National Park, Brazil. From the comfort of Wolf Camps, you can see some of the most exciting wildlife in Brazil. 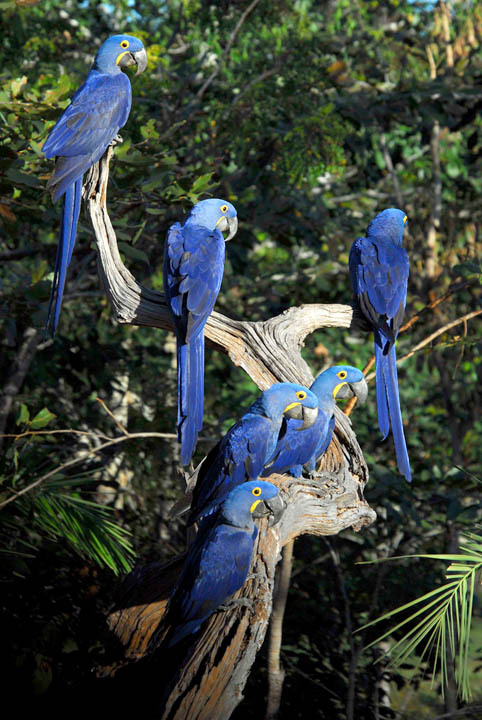 The park harbors more than 1,500 Hyacinth Macaws – 50 to 100 times more than any other national park. It also is the most important reserve for the endangered Maned Wolf, which is the world’s largest and most beautiful wild canid. Finally, the Parnaíba Headwaters National Park is the only place on Earth where Bearded Capuchin Monkeys demonstrate the world’s most complex tool use by a non-human primate. This incredible display of intelligence was reported for the first time in 2004, initially in National Geographic Magazine and then worldwide in a BBC TV documentary. There is only one place to see all of these amazing creatures, and that is Wolf Camps. The only visitor infrastructure at the Parnaíba Headwaters National Park. 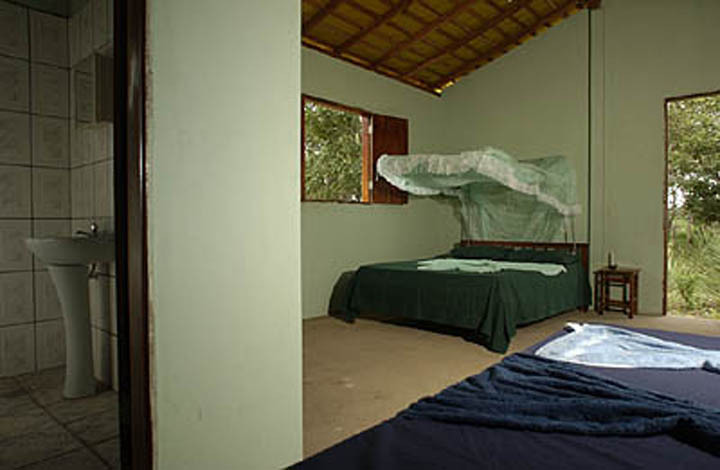 A private bungalow at the Wolf Valley Camp, Parnaíba Headwaters National Park, Brazil. Wolf Camps is the only visitor infrastructure at the Parnaíba Headwaters National Park. The camp complex is divided into three strategically-located compounds, separated by scenic drives of 60 to 90 minutes: Wolf Valley Camp, Wolf Cliffs Camp and Nutcracker Monkey Camp. Wolf Valley Camp and Wolf Cliffs Camp have seven double-occupancy bungalows with private bathrooms, while the Nutcracker Monkey Camp has walk-in tents equipped with full beds and shared bathrooms. With its green, open, palm-studded valleys rimmed by red-rock cliffs and mesas, 300 to 600 feet tall, the scenery at our locales looks remarkably like verdant parts of the American southwest. Scientifically-designed photo blind near the flock of Hyacinth Macaws, Parnaíba Headwaters National Park, Brazil. 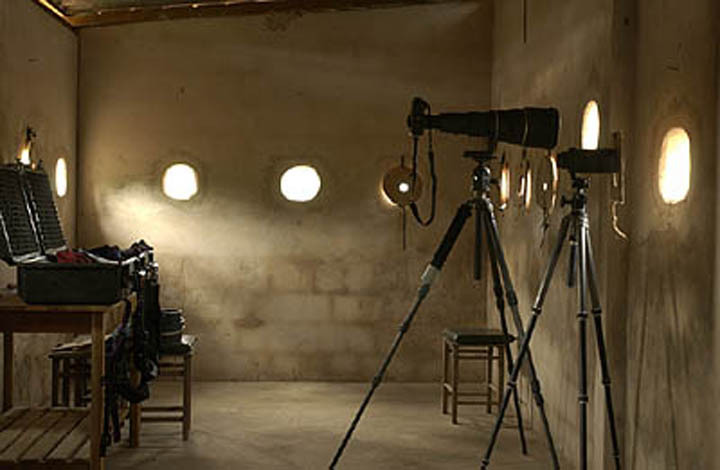 Excellent sunlight for photography, superb scenery and extraordinarily exotic animals create a unique opportunity to become the nature photographer of your dreams. Scientifically-designed observation blinds deliver unbelievable photo opportunities, including dozens of Hyacinth Macaws and Green-winged (Red-and-Green) Macaws at only 30 feet (9 meters), Maned Wolves at only 10 feet (3 meters) and tool-using Bearded Capuchin Monkeys at 30 feet. Additionally, we are often rewarded with excellent views of Red-legged Seriemas, Blue-and-Gold Macaws, Greater Rheas, White Woodpeckers, Jenday Conures and Black-and-Gold Howler Monkeys. Wolf Camps surprised the world by instantly shouldering aside the Pantanal as the best wildlife destination in Brazil. The Parnaíba Headwaters National Park is three times larger than all the protected areas in the Pantanal combined, and no lodge or combination of lodges in the Pantanal can provide so much charismatic, colorful wildlife at such close range and in as little as three or four nights! Blue-fronted Parrot, Parnaíba Headwaters National Park, Brazil. The distant herons and caimans of the Pantanal, while wonderful, simply cannot compare with charismatic wolves, “Nutcracker Monkeys” and close-up macaws. Moreover, Wolf Camps is easy and fun to visit at any time of year, as it never floods and is virtually free of mosquitoes. Wolf Camps allows you to visit the world’s largest and most spectacular dry forest park and enjoy some of the rarest and most beautiful wildlife of the Americas. Your friends will never have seen anything like the quality of wildlife photos and video that you will bring home. Enjoy a wildlife experience you thought was available only to National Geographic photographers, and at a surprisingly affordable price. Some of the rarest and most beautiful wildlife of the Americas. 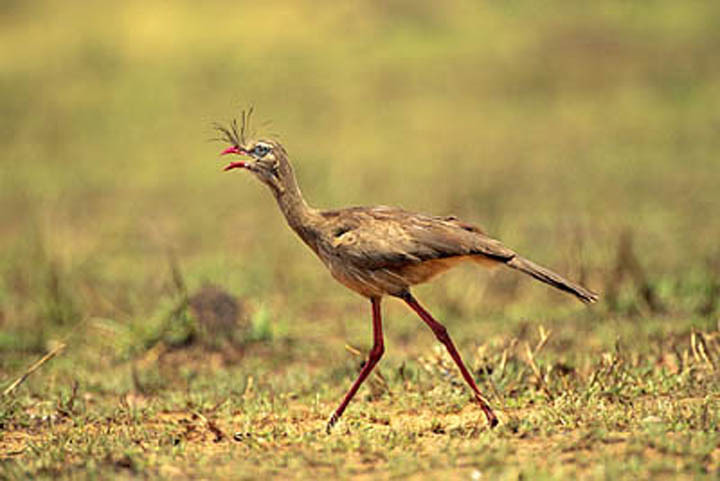 Red-legged Seriema, Parnaíba Headwaters National Park, Brazil. Wolf Camps consists of three separate camps, separated by scenic, 60–90 minute drives. You reach the camps by flying on large turboprop planes from the cities of São Paulo or Salvador da Bahia to the city of Barreiras and then driving five hours north. This region of Brazil has no malaria and almost no mosquitoes or other biting flies. We recommend three to six nights at a combination of the three sites to properly view all four of these unique spectacles: Maned Wolves, tool-using Bearded Capuchin Monkeys and separate, large flocks of Hyacinth and Green-winged (Red-and-Green) Macaws at close range. All the additional wildlife and world-class cliff scenery represent “icing on the cake”. These attractions peak during the long, cooler dry season, running from April through October, but there is excellent wildlife viewing in every month of the year. We believe that the amount of amazing wildlife one can photograph well at the Wolf Camps lodges exceeds that of any other location in Brazil. To get wildlife treasures at close range in such good light with such a high degree of predictability in other parts of Brazil requires that you cobble together visits to a variety of locations rather than just one destination. Our wildlife treasures include what biologists generally consider to be the world’s most beautiful wolf or wild canid of any kind, the Maned Wolf, an endangered species. Wolf Camps also offers what is absolutely the world’s largest photographable flock of Hyacinth Macaws and the best photo angles, light and backgrounds for this endangered species. Wolf Camps is the only spot in the world to photograph the tool-using Bearded Capuchin Monkeys, or “Nutcracker Monkeys.” And the Green-winged Macaws – well, Wolf Camps is currently the best place in Brazil, and quite likely the best place in the world, to photograph those macaws well at close range in perfect light and also while flying in excellent light on predictable flight paths with beautiful backdrops. As the tallest and perhaps most elegant wild canid, the shy, endangered Maned Wolf is considered either very hard or nearly impossible to see well in nature, especially during the day in natural habitat. Now, we have solved this challenge through an investment in 10 years of continual protection and monitoring of a stable population of this beautiful, lithe creature in the heart of the 1.7-million-acre Parnaíba Headwaters National Park that lies a half day of travel north of the Brazilian capital of Brasília. 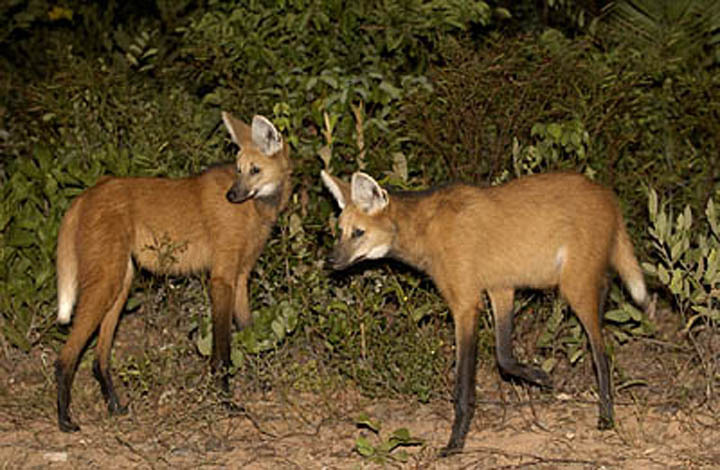 The wildlands inside and surrounding this very large national park feature some of the best scenery in Brazil and other amazing wildlife in addition to the world’s best Maned Wolves. 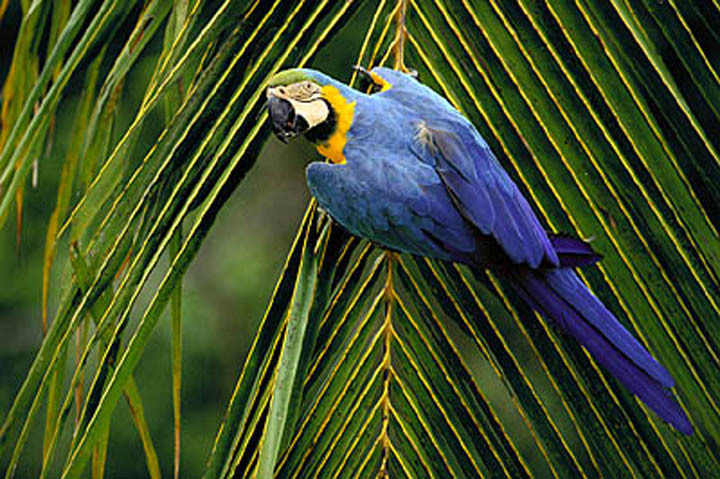 At 100 centimeters (39 inches) from beak to tip of its long tail, the all-cobalt-blue, 1.5-kilo Hyacinth Macaw is the largest and most spectacular of the world’s 345 parrot species. In all the world, this colorful macaw is most easily seen and photographed during visits to the Pantanal Lodge on one of our Jaguar tours (where the world’s tamest wild pair of this species holds court daily at five meters from your camera lens) or during visits to the Wolf Camps. In certain months at the Wolf Camp, we guarantee flocks of 40 to 100 of these macaws in perfect light at distances of only 10 to 20 meters, sometimes with a background of deep-red cliffs, a setting that is not available in the Pantanal. Wolf Camps’s founders discovered in 2001 in northeastern Brazil that troops of cat-sized Bearded Capuchin Monkeys use special, igneous hammer rocks to crack palm nuts that they place on sandstone anvil rocks. This amazing discovery, which first appeared in National Geographic Magazine and later on worldwide TV, is the world’s first documented case of tool use in wild monkeys. After 10 years of protecting these “Nutcracker Monkeys” and their forest habitat, Wolf Camps now offers our guests exclusive, ringside seats to witness in person the real-world version of the introductory scene from 2001: A Space Odyssey. Burití palms (Mauritia flexuosa), Parnaíba Headwaters National Park, Brazil. 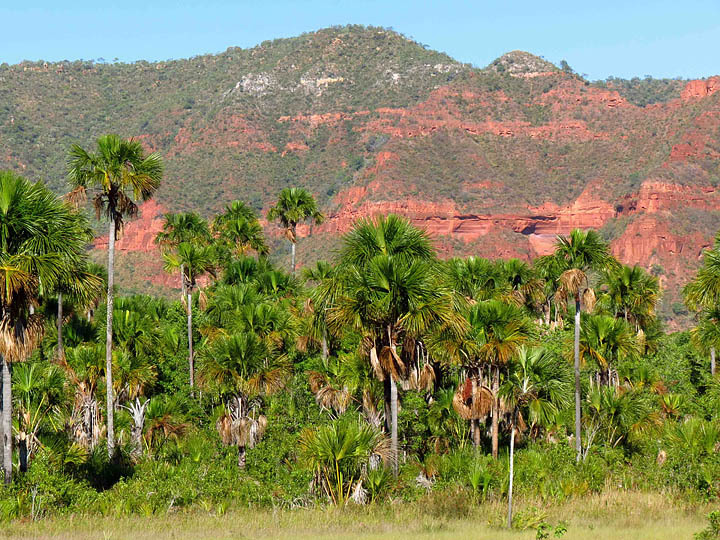 Land in Barreiras in the late morning, where your naturalist guide will meet you and immediately drive with you in an air-conditioned vehicle for four-and-one-half hours north on mostly paved road into the southern part of Piauí State. Lunch at one of several possible roadside restaurants (depending on your degree of hunger). The last hour of that drive is quite scenic, with a number of dramatic 1,000-foot-tall, red-rock cliffs and mesas. At that point, in the hamlet of São Gonçalo do Gurgueia, switch to sit in seats or on benches with cushions in the open back of a large four-wheel-drive pick-up truck. Drive one-half hour (13 kilometers) on a rock, dirt and, finally, sand road to the Wolf Valley Camp, first of the three Wolf Camps. Wolf Valley Camp is famous for its large flock of Hyacinth Macaws seen at a roomy blind (“hide”) that is located two kilometers from camp. Within 10 steps of the camp itself are wonderful, photogenic Tufted-eared Marmosets and colorful birds, all at eye level with natural backgrounds that are ideal for photos. Check in to your roomy, double-occupancy bungalow with private bathroom, and then head out in the pickup to the Hyacinth Macaw blind to try to get some close-up views (from 9 to 20 meters) of these amazing macaws, the largest of the 345 parrot species of the world. The flock of macaws often exceeds 20, and even 40, and on extreme days, more than 60 or 80. The record is 106 macaws there at the same moment. The birds are both on the ground and in low trees, thus affording perfect chances for observation of behavior and for photography with a non-sky background, which makes their bright blue color stand out superbly. Return by truck to the camp, a warm shower, dinner and overnight at Wolf Valley Camp, which lies on the very edge of the 1.7-million-acre Parnaíba Headwaters National Park. Electricity for lights and camera charging is in each bungalow and stays on until 9:30 pm or 10:00 pm, as agreed upon with you and your guide. Overnight at Wolf Valley Camp. Meals: Lunch and dinner. Maned Wolf, Parnaíba Headwaters National Park, Brazil. Visit the macaw blind (“hide”) again in the morning for two to three hours of observation and photography of the Hyacinth Macaw, the world’s most spectacular parrot. Then return to the camp and marvel at and photograph the colorful birds nearby. A family of Tufted-eared Marmosets visits quite often, as well. In the afternoon, drive slowly for one hour on a 23-kilometer-long, sand road into the very heart of the national park, enjoying the cliff scenery and stopping for photos of the Burrowing Owls and spectacular views of “Red Mountain.” Check into roomy bungalows at Wolf Cliffs Camp, our rustic camp in the center of the park. Our bungalows there each have a private bathroom with flush toilets (flushed by hand with a bucket). Showers are taken with warm water available in large, clean buckets, camp-shower style. This camp is visited so seldom that it is like camping in bungalows rather than like a finished lodge. But the location is worth it – on a hilltop with views of tall red cliffs in the distance. And the location is doubly worth it because the world’s tamest and most reliable Maned Wolves arrive to forage in natural settings just a few meters from the camp. Sometimes the wolves arrive during the late afternoon or early morning light, but often they arrive after dark. Overnight at Wolf Cliffs Camp. Meals: Breakfast, lunch and dinner. Blue-and-Gold Macaw, Parnaíba Headwaters National Park, Brazil. Try to see the wolves in the morning, but if they are not around, then watch birds, such as the brilliantly-colored Jenday Parakeet. In the mid-morning, drive back to Wolf Valley Camp for lunch. Often in July and August, there are one or two very photographable Blue-and-Gold Macaw nests near either Wolf Cliffs Camp or Wolf Valley Camp or not far from the 20-kilometer-long sand track that links the two. In the afternoon, visit the macaw blind again or observe birds and Marmosets near the camp. Overnight at Wolf Valley Camp. Meals: Breakfast, lunch and dinner. Bearded Capuchin Monkey smashing palm nut, Parnaíba Headwaters National Park, Brazil. Drive very early, near sunrise or before sunrise, for two hours on sand, dirt, asphalt, dust and sand road to the Nutracker Monkey Camp in a remote, scenic valley north of the national park. The reason for the extra early departure is to try to reach the Nutcracker Monkey Camp in time to see the world’s only visible troops of Capuchin Monkeys that show the world’s most complex tool use by a non-human primate. 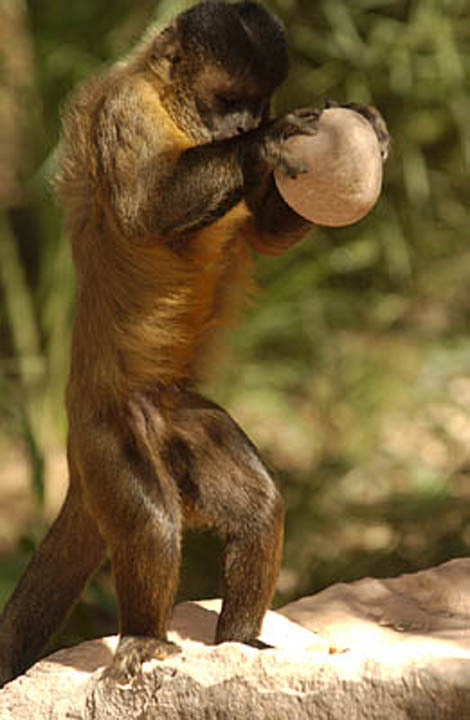 These industrious monkeys gather and then wield special, heavy, igneous hammer rocks to crush palm nuts that they place carefully in divots on softer, sandstone anvil rocks. 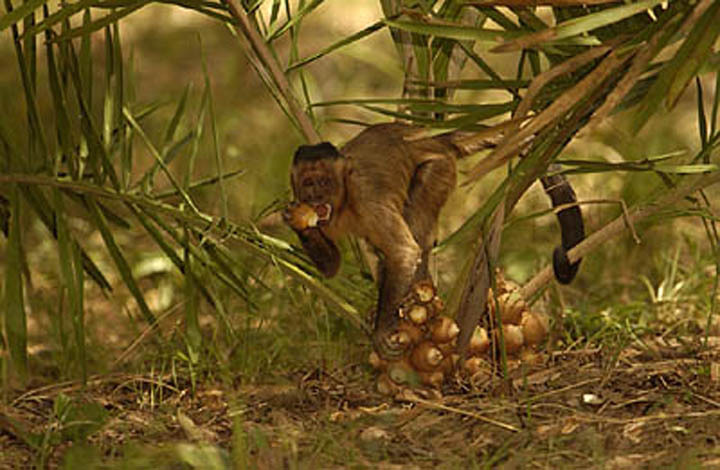 The monkeys perform this foraging trick for two periods each day, once in the morning and again in the afternoon. We want to get there early enough to see the morning session. As the monkeys now are so accustomed to human observers, one can watch this unique tool use from close range without use of a blind or hide. Some groups of guests will view this amazing behavior for a good session in the morning, and then plan to drive back to Wolf Valley Camp in the middle of the day. Other guests will stay until the late afternoon to see the second nut-cracking session by the monkeys, and then will drive back to Wolf Valley Camp. And finally, tougher guests accustomed to even more rustic camping may choose to sleep at the Nutcracker Monkey Camp in walk-in tents. For those who sleep overnight at the Nutcracker Monkey Camp, there are warm camp showers, private bathrooms for each tent (but of a dry, camp-toilet style) and cots or inflatable mattresses inside the zip-up tents. For those who wish more comforts, it is best to return to Wolf Valley Camp for the night. Overnight at Nutcracker Monkey Camp or Wolf Valley Camp. Meals: Breakfast, lunch and dinner. Today we visit the Hyacinth Macaw blind again at Wolf Valley Camp and enjoy more views of the excellent fauna near the camp, including King Vultures. Depending on availability and on the quality of the wolf viewing on the first visit to Wolf Cliffs Camp, we may do an afternoon visit to that camp to try see the wolves again. Sleep that evening either in Wolf Valley Camp (more likely) or, perhaps, at Wolf Cliffs if we need more time to see the wolves well. Overnight at Wolf Valley Camp or Wolf Cliffs Camp. Meals: Breakfast, lunch and dinner. Large flocks of Hyacinth and Green-winged Macaws at close range. 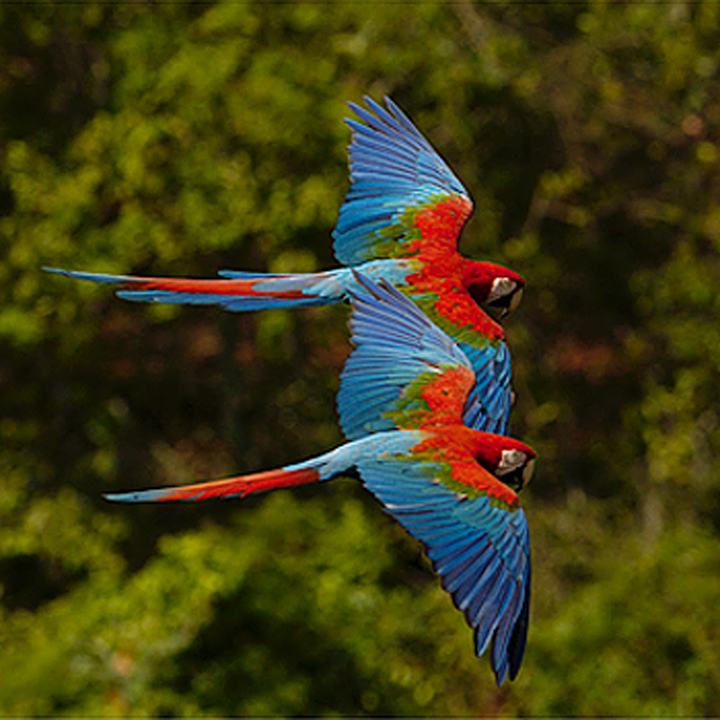 Green-winged (Red-and-Green) Macaws, Parnaíba Headwaters National Park, Brazil. One final day at Wolf Valley Camp to work on the large flock of macaws and on the other fauna there. Overnight at Wolf Valley Camp. Meals: Breakfast, lunch and dinner. Hyacinth Macaws, Parnaíba Headwaters National Park, Brazil. Photography: Mariana Valqui. Maned Wolf & Hyacinth Macaw Photo Tour. We pay one last, early morning visit to the flock of Hyacinth Macaws and then in the late morning, we leave Wolf Valley Camp around 9 am and drive five hours to Barreiras, in time for lunch and the sunset flight back to Brasília. Meals: Breakfast and lunch.